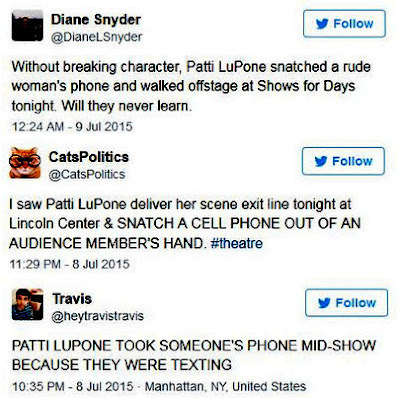 According to Broadway World's astute message board posters, the trouble began at the show's matinee performance, which Auggie 27 described as 'Cell Phone Hell.' The post reads: "The SECOND ACT of the "Shows for Days" matinee today was besieged with cell phone ringing, first one long unanswered call that threatened to ring for the rest of the performance, and then two or more which resulted in someone leaping up and answering in the semi-opened door. At the same time, a hearing aid apparently went haywire, and buzzed into the ether for the remainder." Ms. LuPone kept her cool throughout the performance, but rightfully reached her limit during the evening performance when she noticed the texting attendee. Lincoln Center has confirmed to Broadway World that the incident did in fact occur. Broadway World also notes that last week an audience member tried to charge his phone in a fake onstage electrical socket during a performance of Hand To God.